This is a beautiful and epic piece of patriotic film making from the dark days of World War II by one of Britain’s greatest artists, the inimitable Noel Coward. It doesn’t hurt that it’s co-directed by David Lean, arguably England’s greatest director. It’s a sweeping and beautifully acted story of a group of soldiers on a doomed ship. 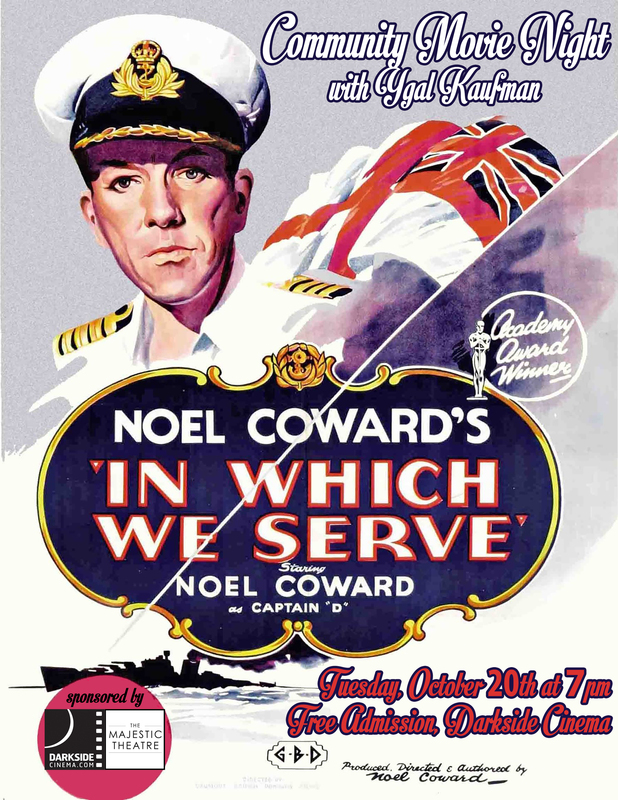 Coward serves every role imaginable in this production that also features a young Richard Attenborough in his first screen role. This CMNYK screening is going down at the Darkside Cinema on Tuesday, October 20th, and the fun starts at 7:00 PM. As always, admission is FREE, but donations are welcomed and benefit the Darkside Cinema renovations. The show will be preceded by an intro from a gentleman with a fondness for almonds, Ygal Kaufman, as well as newsreels, shorts, cartoons and other weird goodies from 1942 to make the experience extra authentic. See you all there! Directed by Shigehiro Ozawa, starring Shin’ichi “Sonny” Chiba. This is a very special CMNYK collaboration event with the 7th annual OSU International FIlm Festival. 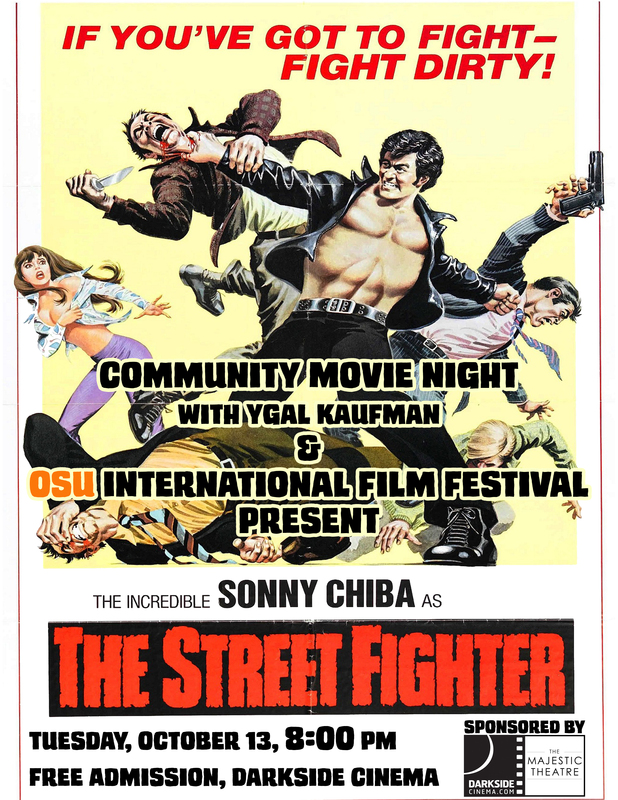 In an effort to fulfill both our mission (showing lost/classic/cult films on the big screen with historical context to Corvallis, for free) and their mission (showing quality foreign films to Corvallis, for free), we’ve got this more-than-legendary exploitation/martial arts film that introduced American audiences to Sonny Chiba. This action masterpiece is not for the faint of heart and features tons of graphic hand to hand combat. It also features an absolutely wonderful soundtrack and some of the most campy, yet often innovative, fighting sequences ever filmed. Chiba would go on to become one of the legends of the action genre, deserving a place on Martial Arts Mt. Rushmore alongside the likes of Bruce Lee and Jackie Chan. This CMNYK/OSUIFF7 event is going down at the Darkside Cinema on Tuesday, October 13th, and the fun starts at 8:00 PM. Repeat 8:00 PM this week, not the usual 7. But we’ll be back on the normal schedule the following Tuesday. As always, admission is FREE, but donations are welcomed and benefit the Darkside Cinema renovations. The show will be preceded by an intro from fantasy football inamorato and pretty decent juggler, Ygal Kaufman, as well as shorts, commercials, cartoons and other weird goodies from 1974 to make the experience extra authentic. See you all there! Don’t forget to sign up at the website for email reminders and notifications about contests and special events! And make sure to stop by our sponsor, The Majestic Theatre, for all their great programming. And make sure to check out some of the many other wonderful films being screened as part of the 7th OSU International Film Festival.